When wound this quality clockwork robot walks along swaying from side to side while sparks flash in his helmet. Has an on-off switch. Stands 22cm (8.5") tall. 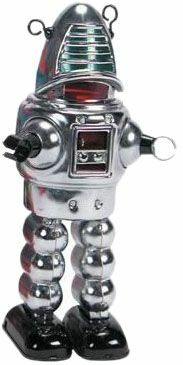 This is a collectors tin robot and should not be given to children.